Each week I enjoy a nice Netball training session whilst preparing for our matches on the weekend. We often use. Netball Training drill Videos like the ones you can see at www.sportplan.net/drills/Netball/Getting-free/Triangle-2-vs-2-TBN0059.jsp to help with our fitness and skill levels. It was after one of these sessions that I went home and whilst watching my favourite Harry Potter film I realised that the game of Quidditch is remarkably like the game of Netball – if you ignore the fact that they are fling on brooms after a magical flying ball. Ok so the main similarity is that they throw a ball through a net, but it got me thinking. After a bit of trawling through my Harry Potter novels and some internet research I found out some interesting facts about the world of Quidditch and I thought I would share them with you. 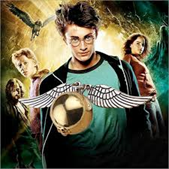 In a book released entitled ‘Quidditch Through the Ages’ to raise money for comic relief, the ins and outs of the game were described, along with the fact that the golden snitch was originally a bird called the Golden Snidget. The aim of the game was still the same, but instead of catching a magical flying ball the seeker was looking to catch a real-life bird. When looking into the world of witches and wizards it is thought that people were being tried for witchcraft in as early as the 1600s. In the world of Harry Potter witches have been using brooms to fly since 962 AD although the early varieties were incredibly uncomfortable and tended to have a mind of their own when it came to the direction of travel. 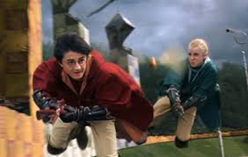 It was after the Cushioning Charm was developed that the brooms became more comfortable and racing brooms become popular and the game of Quidditch was elevated to a whole different level. The Quidditch World cup as see in the Goblet of Fire film was actually filmed at Beachy Head in East Sussex. The chalky white cliffs appear in the background for many of the shots. The location used for the film is very different to the one that Harry describes in the books. In many of our modern-day team sports we are used to the matches entering extra time which c last for around an hour in extreme cases. However, the longest game of Quidditch ever played latest a total of three months. Now that is dedication for you. Next Next post: How does a steam oven work?